Hashim Thaçi is the President of Kosovo. I am pretty sure that in Kosovar politics, the citizens of Kosovo have no doubt at all that we, as institutional leaders of Kosovo, must work together aiming to, in a shortest possible time frame, conclude the talks with Serbia and sign the agreement on normalisation of relations between the two states. We have fought against the violent occupation by Serbia and have won our freedom in June of 1999. This history is known to all of us, because it brought all Albanians together, it brought Kosovo together with the West, fore mostly with the USA, North Atlantic Alliance and the EU. We, together with our allies, managed to make Kosovo a state in February of 2008 and since then we have been recognised by 116 states all around the world. However, we all know too well that long term stability of the state of Kosovo is unavoidably related to Kosovo’s membership as a state, in the UN, in NATO and EU. In this manner, Kosovo will be a viable state for eternity and a day, a member of the peace loving nations in the UN, member of the strongest military alliance in the world, NATO, and finally, a member of the European Union. We cannot achieve these ambitions, we cannot seal once and for all the fate of Kosovo as a state, if within the next coming months we do not achieve the legally binding agreement with Serbia. Many of you might say that as a state we have deserved that our traversing towards UN, NATO and EU was different, easier, faster and not dependable on the peaceful agreement with Serbia. You are right to think so, but, the regional and international realities are imposing the achievement of the agreement on normalisation between the two states, as a necessary condition for the EU membership. The agreement can only be achieved if the parties compromise. You may again say that Kosovo has already made all its painful compromises. I agree with you again. But the reality is more stubborn than our arguments. Recognition by Serbia is our primary hindrance on or Euro-Atlantic journey. Someone may say that Serbia should recognise Kosovo unconditionally and within the existing borders. I also want the same thing. But do you think that we could convince Serbia to do such a thing soon enough? Unfortunately not. And the EU and our strong allies, USA, Germany, United Kingdom, France, Italy and many others, do you think they can convince Serbia to recognise Kosovo? Again, not. They could not convince her to do such a thing until today and they cannot guarantee that they will do it tomorrow or in the near future. As a result, the responsibility rests with us. To reach this aim, I have proposed the option of border correction with Serbia. I have argued that eventual agreement on peaceful border correction with Serbia ensures Serbia’s recognition of Kosovo as well as the union of Presheva, Bujanovac and Medveja with our country. I have expected rational counter arguments but all I have heard to date is lots of noise and in worst cases, hatred. Kosovo is too small a country to produce so much hate, which divides our society. By now, we all know that Kosovo has always been treated as a special case, or “Sui Generis”, in the large international undertaking for the solution of all problems around it. In this context, the war for liberation, NATO humanitarian intervention, declaration of the independence of Kosovo, in a coordinated manner with the international community, supervised independence and state building, are only some of the attributes which made Kosovo be treated as a special case. Local and international dilemmas have accompanied all these processes. Thus, on the eve of the declaration of independence, there were concerns that Kosovo may serve as precedent for other countries or regions around the world. But, those concerns turned out to be unfounded. Another great concern that came up was the fear of mass exodus of the Serbian community in Kosovo, right after the declaration of independence. This also turned to be an unfounded presumption. Kosovo today is an independent state, and we are currently at the final stage of state building. But here are dilemmas now, as there were previously. Strangely enough, at the time when Kosovo has opened the opportunity to achieve a peaceful agreement with Serbia, abruptly and from many directions, new unfounded concerns arise. Sceptics have joined together again today, to oppose the real option of the peaceful border correction with Serbia, as an opportunity for mutual recognition between Kosovo and Serbia. I repeat, correction of border between Kosovo and Serbia, as two independent states, which will recognise one another as states, which will be a part of the demarcation of 430 kilometre long borderline. 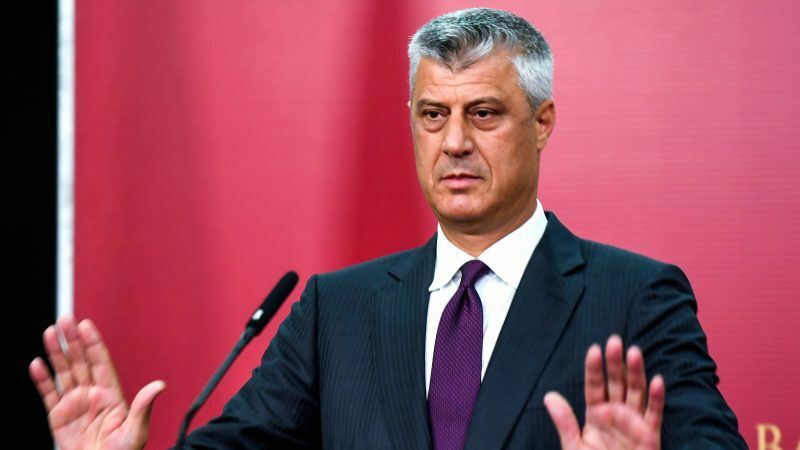 The non believers of the legally binding agreement between Kosovo and Serbia are with ease dispersing fear on quasi destabilisation of the region and ethnic divisions in the Balkans. They are creating panic and obscurity, by falsely conceiving the same arguments as on the eve of the declaration of independence. I have high consideration for all those who have in a rational manner been involved in this debate, but to those who only manage to produce noise and panic, I can with all due respect say that they are wrong. During the last few days I have had many important meetings with most important politicians of the countries of the region. First, I met with Ilir Meta, President of Albania, then in Podgorica I was received by Milo Djukanovic, President of Montenegro, and most recently I spoke to Zoran Zaev, Prime Minister of Macedonia in Skopje. At all these friendly and sincere meetings, I made clear our ambition for an agreement with Serbia, by ending a century long animosity and by preserving the stability in this part of the Balkans, but also for our aim to further expand the cooperation and friendship with all the countries of the region. Peaceful agreement based on the correction of the border between Kosovo and Serbia, if achieved, will be fully in compliance with the international law. Such an agreement, ensures formal recognition of Kosovo by Serbia, ensures the unification of Presheva, Bujanovac and Medveja with Kosovo and opens up the definite membership path for EU, NATO and UN membership, thus strengthening the stability and finale closing the last source of conflicts in the Balkans. Henceforth, I can assure the sceptics that there will not be a border correction along the ethnic lines, there will be no exodus of population or a domino effect as far as the stability of this part of Europe is concerned. Furthermore, this peaceful agreement will place a weighty rock on the so called “Pandora’s Box”, which is spoken about with such passion lately. And if anyone else arguments it as, and refers to the eventual agreement on the peaceful border correction as a precedent, then this case could indeed be used in the future as an indispensable positive precedent for the solution of disagreements between states in a peaceful manner and not by war. The time of wars and conflicts between Kosovo and Serbia, in my opinion, has elapsed. But the end of this era can only be ascertained when we reach the final peaceful agreement between Kosovo and Serbia.